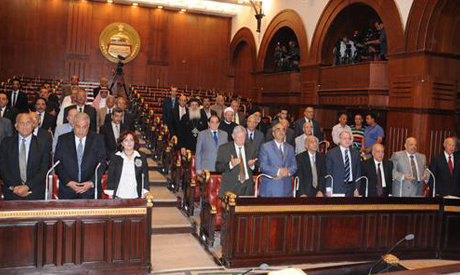 The 50-Member Committee tasked with finalising Egypt's new constitution is in the final days of its work. The committee is expected to put the new constitution to a final vote among its members at the end of this week, or early next week. According to Mohamed Salmawy, the official media spokesperson of the committee, the committee is expected to finish its task by 3 December — or few days ahead of this deadline. Salmawy told Ahram Online that the committee has drafted most of the constitution's articles. "The number of the new constitution's articles is expected to stand at 242 articles, with six articles more than the constitution drafted by an Islamist-dominated Constituent Assembly last year and 31 articles more than the 1971 Constitution (whose total articles stood at 211)," said Salmawy. In the words of Salmawy: "I said before that the new constitution's articles would stand at 241, but this changed after the committee endorsed on Thursday evening an article obliging the state to fight terrorism." "As a result, the new constitution's total number of articles increased to 242, while the number of new articles rose to 40," Salmawy added. Salmawy disclosed that the breakdown of the constitution's articles goes as follows: 51 articles under chapters on the state and foundational principles of society; 59 articles under chapters on freedoms, rights and public duties; and 132 articles under the chapter on the system of governance. "The new 40 articles were mostly endorsed to grant more freedoms and observe social justice," Salmawy said. Salmawy, however, refused to disclose who proposed the new article on terrorism. Some sources said the article was proposed by the two representatives of the ministries of defence and interior, arguing that "after 10 army soldiers were killed last Wednesday in an ongoing ferocious war against terrorism in Sinai, it has become an inevitability that a new constitution aiming to restructure the political frame of the country states that the war against terrorism must be a constitutional principle in Egypt." Salmawy explained that, "When the new article was proposed, most members stipulated that the government's policy in fighting terrorism must go in line with international conventions and observe human rights." Salmawy also indicated that, "The new article will oblige the coming parliament to draft a new terrorism-combating law, with the objective of granting the state greater powers in fighting this kind of crime, especially in exceptional times." The new article states that, "The state is obliged to fight all forms of terrorism in line with the definitions put forward by the United Nations and mobilise to uproot its intellectual, societal and material sources because of their threat to the nation and society, and without violating public rights and freedoms," and the anti-terrorism law would state "all the rules and measures necessary to fight terrorism and ensure fair compensation for the damage caused by it." On other matters, Salmawy indicated that between 17 and 20 articles have so far failed to garner consensus among the committee's members and will be subject to a second reading during the committee's closed-door meeting Saturday. "We hope these articles will gain consensus, because if not, they will be subject to the final vote and if they get more than 75 per cent approval, they would be endorsed and final," said Salmawy. Salmawy said that no decision has been reached on "the quotas" to be allocated to certain marginalised sectors in the new constitution to ensure that they are fairly represented in upcoming parliaments. "A mini-committee was formed on this issue, but it has not yet reached a decision," said Salmawy. In its closed-door meeting Saturday, the 50-Member Committee is slated to also discuss the new constitution's preamble. A five-member sub-committee including Salmawy, poet Sayed Hegab, Professor Abdel-Gelil Mostafa, Salah Fadl, professor of literature at Cairo University, and Mahmoud El-Rabie, a professor of political science at the American University in Cairo (AUC), has finalised drafting the preamble. "This preamble forms an integral part of the constitution, explaining its philosophy and stressing in clear terms that it reflects the goals of the 25 January and 30 June revolutions," said Salmawy. The preamble begins with stating that "Egypt is the gift of the Nile," then goes on reviewing the history of modern Egypt, focusing on the revolutions of 1919 that instituted the principle of "Egypt for all Egyptians and religion is for God and homeland is for all," and the 1952 Revolution that secured national independence, put an end to British colonial rule in Egypt. The preamble then moves to stress the goals of the 25 January and 30 June revolutions: mainly achieving social justice, national independence, freedoms and rights, and separating religion from politics. According to the preamble, "The constitution is for a civilian, democratic and modern state in Egypt." The above words triggered, however, furious reactions from Mohamed Ibrahim Mansour, representative of the ultraconservative Salafist Nour Party. Mansour, in a request submitted to chairman of the committee Amr Moussa, said "The party strongly rejects the word 'civilian' because it reflects Western and secular values." "We want the word 'civilian' to be omitted from the preamble and it is enough to state that the constitution is for a democratic and modern Egypt," read Mansour's request. Mansour also wanted the preamble to state that the new constitution aims to keep abreast of Islamic Sharia and the latest international developments. The preamble states that, "We write a constitution that opens the road for the future and is in line with international conventions on human rights, which we played a role in writing and endorsing, and which the honourable institution of Al-Azhar stressed go in line with the noble goals of Sharia." Mansour also rejected a phrase stating that "A new chapter of the constitution promotes all forms of culture, including painting, music and theatre dramas." Mansour wants the words "painting, music and theatre dramas" to be omitted, deeming it enough for the constitution to promote "all forms of culture." In contrast, representatives of three Egyptian churches and 28 representatives of various secular forces requested that the word "civilian" remain part of the constitution's preamble. Bishop Paula, representing the Coptic church, threatened to withdraw from the process if the word was omitted. Hussein Abdel-Razeq, the representative of the leftist Tagammu party, said "the word civilian is necessary to stress that Egypt is not a religious state; it also reflects the 30 June Revolution's principle of separating religion from politics." Indeed it is important to stress that Egypt is a ' CIVIL ' state. No one's rights is to be compromised in the name of religion .and conversely, no one is to gain an advantageous position in relation to other groups and sectors of society in the name of religion. The very CORE concept of citizenship means that all citizens are EQUAL regardless of race, gender , religion or ethnicity. Failing to stress the civilian character of the state would compromise the concept of citizenship. Also, I am surprised that Al Nour party does not want the fine arts to be spelled out as if they were TABOO. I think Al Nour party must revise its doctrine if it is to hope to be part of indeed a ' civilian democratic modern' Egypt. Islamist agendas and the constitution. First of all, sharia as defined by conservative Muslims today is not in line with international conventions on human rights. Wife beatings, criminalizing apostasy, female genital mutilation, and treating non muslims and women as second class citizens give the lie to that assertion. Second, absolutely we need to enshrine fighting terrorism as a constitutional mandate for the military. Morsi as president had stopped the military from countering the growing terrorist threat in Sinai, with the catastrophic results we see today. As a matter of fact, extremist non-Islamists list the military's ongoing purge of terrorists as one of cc's failings, because "he is killing Muslims." We need aconstitutional obligation to fight terrorism, so that never again will a brainwashed non-Islamist president be able to stop vigorous responses to terrorist threats. The Islamist terrorists are becoming irrelevant . Civility rubs them the wrong way. Where is the right to terrorize Egyptians? Where is the right to kill the police? Where is the right to marginalize women? Whee is the right to beat up your wife? Where is the right to burn a tram? Where is the right to burn churches? If Western values mean civilized behavior, respecting and sheltering nature, animals and mankind,equality between men and women, protecting handicapped people, old ones and children, respecting laws and orders, then a very big YES to Western values, because all of those values you don't find in today's Egypt anymore and most of them also not in other Islamic countries!!! What is wrong with "civilian"
It is hard to understand what is it about that word that is Western. Maybe it should be changed to "civilized" which is a better word for this purpose. Actually civil and civilian and civilized derive from the same root and Egypt is the mother of all three as the oldest civilization in the world where rule based on justice was first implemented so it is quite reasonable to include it. It feels like the opposition to this concept is based on a misunderstanding of its meaning, for example, people often mention Islamic civilization as a basis for social justice does he now wish to drop that expression as "un Islamic"? Actually it was the basis for the spread of Islam and now suddenly it belongs to the "West". My message to this person is, look at history and see that both Egypt and Islam always promoted a civilian, civil and civilized basis for government which was only compromised when the Memluk slaves ascended to power and based rule on military prowess and coercion and if he is opposed to military rule which he says he is, then why not state "civilian" in the preamble. I think the best approach is to just ignore him and his misunderstanding of history and move on with the process as it is just attention getting behavior pure and simple. Please, those who occupy their minds with Western-phobia should mainly focus on what any culture can offer and how Egyptians can benefit from it. There is good and bad in any culture, the Egyptian/Islamic is not an exemption. And the word "civilian" clearly represent all religions, believers or non-believers who are part of Egyptian society. Decent people of Egypt shouldn't be labelled in any way, there all are just "civilians". What a farce document and waste of time.